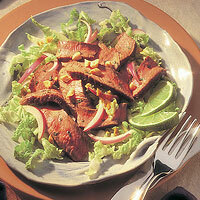 A Serrano pepper in the citrus-soy dressing brings a pleasant amount of heat to this beef salad creation. Heat large nonstick skillet over medium heat until hot. Place beef steaks in skillet; cook 12 to 15 minutes for medium rare to medium doneness, turning occasionally. Remove; let stand 10 minutes. Carve steaks. Combine beef, onion and cilantro in medium bowl. Add dressing; toss. Serve on salad greens. Sprinkle with peanuts.